Ceremonies were held in a number of Chinese cities on 28 Sep to celebrate the 2,566th anniversary of Confucius’ birthday, a great philosopher and educator in ancient China. In Qufu City, hometown of Confucius in Shandong Province, more than 2,000 people marched toward the Confucius Temple. Participants wearing traditional costumes perform during the ritual. More than 500 people bowed to the statue of Confucius at Yuelu Academy in Changsha, capital of central China’s Hunan Province. They also recited his classics together. 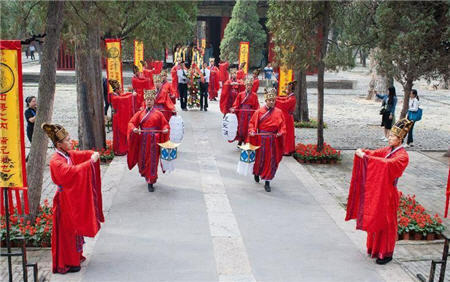 A ceremony was held at the Confucius Temple in Beijing. For thousands of years, Confucius has been regarded as a symbol of China’s traditional culture, as well as the country’s intellectuals. He was venerated as a great sage in ancient China, and despised as a regressive pedant during the decade-long Cultural Revolution (1966-1976). The 4th ethnic groups opera show kicks off in Beijing in October 12.